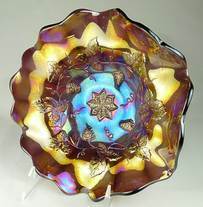 Sell me some Millersburg Glass! 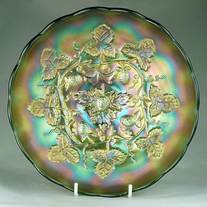 As many old newspapers and journals are digitised and put online, they provide an amazing insight into how Carnival Glass was originally promoted, marketed and sold to the public, either directly, or by other means like mail order and wholesalers. 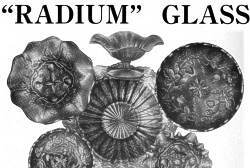 Here are two contemporary adverts for Millersburg Radium Carnival Glass. The selections would be made up and despatched directly from Millersburg's factory. February 1911 - this ad was putting a very positive spin on what in reality was a difficult time for Millersburg. We know that the factory had actually shut down for a week or so at exactly this time - late January—early February, 1911. Legal proceedings by the Hipkins Novelty Mould Company (for unpaid bills) were due to be heard in the Holmes County Court, and yet John Fenton still managed to sound upbeat. The selection on offer in these ads did not change between February and November 1911, which is not surprising given that the business was in trouble and was actually in receivership for five months of this period. - the four bowls around the centre are Grape Wreath (top left), Grape Wreath Variant (top right and bottom left) and Blackberry Wreath (bottom right). The images show 3 out of the 4 different centre variations that Millersburg used on these "Wreath-style" patterns - as illustrated on the right. These two ads from 1911 tie in exactly with other contemporaneous press reports that we revealed for the first time in "Magnificent Millersburg - the Rise and Fall". 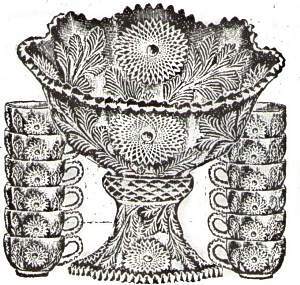 Follow these links to read about "The Rise" and "The Fall" of this great glassmaker. All Cox & Lafferty images originally from the New York Public Library, digitised by Google.